Sacrificial series of kukris are kukris used all over Nepal during Nepal's biggest festival " Dashain ". Nepal being a religious country carries out many cultural and religious ceremonies where kukris are often worshiped or used. Among them " Dashain " happens to be the festival in which a long kukri is a must to have to perform ritual sacrificial ceremonies on animals smaller and larger. A sacrificial ceremony on any animal must be done in one single blow otherwise considered bad luck or bad omen. 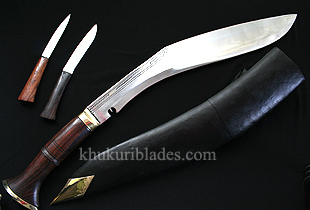 This series of kukris comprise of kukris that are of 15" to 36" long blades. The most popular size used in Nepal is the 18" long blade. This long 18" incher comes with different handles from wood to horn to metal (brass/aluminium) and also with different scabbards. This Long 18" sacrificial is used for sacrificing animals during Nepalese biggest festival Dashain.